Shop beautiful handmade items from around the globe with proceeds going toward our communities most vulnerable children, adults and seniors. 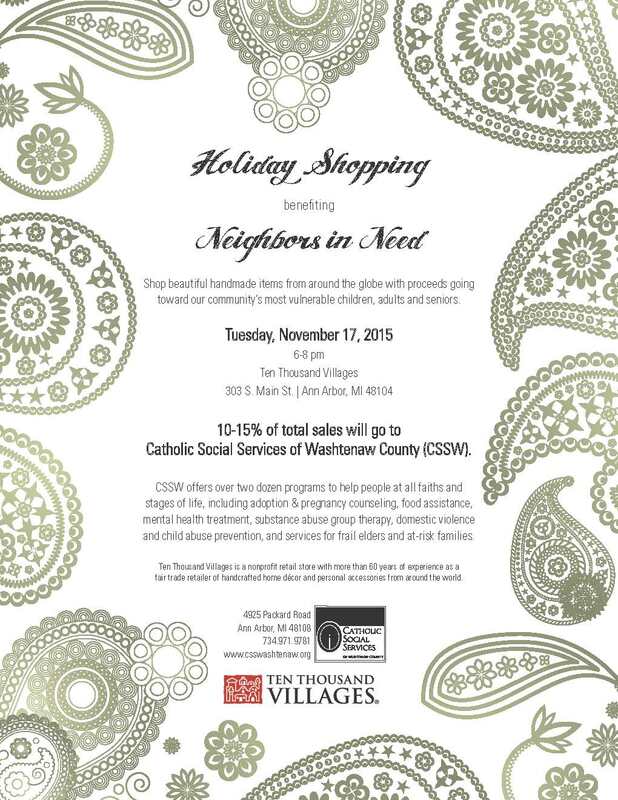 10-15% of total sales will go to Catholic Social Services of Washtenaw County (CSSW). Click the image below for a printable flyer! 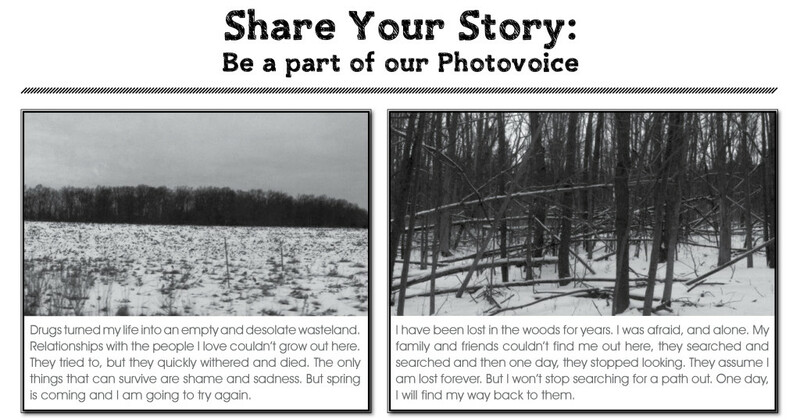 For more information or to find out how you can share the PhotoVoice project at your location, please call 734.712.7253. Think about the last time you treated a chronic medical condition with medication that required refrigeration or adherence to a precise schedule? What if you needed a device like an air filter or sleep apnea machine, and you had no electricity and no way to maintain a regular schedule? A trip to the emergency room in the throes of something like an asthma attack or diabetic coma is likely. Now, imagine that trip repeating itself over and over again, in a span of a few months. Imagine getting stuck in “the revolving door of crisis services,” as the Catholic Social Services of Washtenaw County put it. This is reality for many high-risk and low-income adults, but the FUSE program has arrived in Ann Arbor to make this a much less-common occurrence. FUSE, or Frequent Users System Engagement, aims to combine housing, care management and health services to improve the quality of life for high-risk adults in the community. Users of FUSE are often referred from homeless shelters or emergency rooms that they frequent. Through the program, these people receive the healthcare they need and deserve, along with housing and other care management. In order to find those who needed FUSE’s help the most, outreach was done at hospitals and with ambulance companies primarily. Shelters, jails, detox facilities, motels, streets and campsites were also part of the outreach effort. Candidates for FUSE aid were homeless or in persistent housing crisis, have a chronic behavioral or physical health condition, have a very low income, and be frequent users of health services. The Corporation for Supportive Housing funds FUSE, as part of a nationwide effort to assist those people caught in the repetitive and draining cycle of hospitals, rehabilitation, and lack of housing. CSH also funds similar programs in San Francisco, Los Angeles, and the state of Connecticut, in hopes that this pilot program will lead to success. Hi, my name is Shawn Story. I am from Inkster, MI. I’ve been homeless for 12 years, and a Groundcover vendor for 5 years. I was approached by Diana Clifford from the FUSE program about how FUSE was helping out people that go to the emergency room a lot. Being a diabetic on the streets is a hard task and being in an unstable environment, I was always passing out and ending up in the ER. I have not been to the emergency room now that I’m in the housing that FUSE helped me to get. My outstanding worker Molly Madden has done miracles in my life by getting me housing, bus passes, furniture, and rides to away appointments. For all of the places I looked for help, there has not been anyone that has been able to do what FUSE has done for me. I’m now a better person, and am involved in the community and being a vendor for Groundcover. My future goals are going back to school and getting my license, so the donations I receive from selling Groundcover really do go towards a good cause. FUSE helped give me hope that I could be healthy again. There are many other stories out there like Shawn’s. While helping high-risk people in the short term, FUSE also aims to reduce long-term healthcare cost for frequent users of hospitals, in terms of insurance, ambulance rides, and actual hospital visits. Their primary goal is for their participants to achieve housing stability, while also managing their health. FUSE could not achieve their goals without the cooperation of many aspects of society, from hospitals to housing. The Catholic Social Services of Washtenaw has taken the lead with FUSE, in cooperation with hospitals such as the University of Michigan Hospital, St. Joseph Mercy Hospital and Huron Valley Ambulance. Housing partners include Avalon Housing, Ann Arbor Housing Commission, Shelter Association of Washtenaw Co., Washtenaw Prisoner Re-entry, Michigan Ability Partners and Washtenaw Housing Alliance. Integrated health services and evaluation services also play a key role in FUSE goals. FUSE may be a pilot program, but it has already changed the lives of many in Washtenaw County. The night was rich with sound and color at our annual CSSW fall event. It was a festive celebration of giving as over a hundred people made their way to beautiful Stone Arch Events Center in Saline for Painting a Brighter Future. Guests were greeted with a signature cocktail or one of the fantastic fall beers donated by Ann Arbor Brewing Company and the sophisticated sounds of the Greg Simon Trio framing the background. Over two dozen donated auction items ranging from the delicate and beautiful to the experiential and fun kept guests busy at the silent auction tables and created some great opportunities for banter. After a tantalizing buffet of savory autumn appetizers, speed painter Tim Decker took the stage and dazzled the room with his energetic and colorful painting exhibition. In the span of thirty minutes, he produced three large and animated portraits of contemporary icons which were then sold at the live auction benefitting the ongoing work of CSSW. The real stars of the evening were the generous guests and donors who raised over $94,000 to support CSSW programs. Dr. Susan Goold compelled the room to think compassionately and give generously through sharing her first hand experience working with FUSE clients and led into Event Auctioneer Tim Patton closing the evening with a paddle-ask auction. It was an inspiration to see the guests responded to Dr. Goold’s call with generous gifts and well-wishes for the vulnerable and marginalized who are served by CSSW.